Exploring the Ronald Reagan Building in Washington, D.C. The Ronald Reagan Building and International Trade Center is a landmark building located in the heart of Washington, D.C. near many of the city's most popular attractions. Built in the 1990s, the building features dramatic architectural features including a a cone-shaped, glass skylight in its 170-foot-diameter Atrium. It houses international trade related businesses, the permanent theater for the comedy troupe the Capitol Steps, a food court, and facilities for conferences and weddings. The outdoor plaza has sculptures and memorials in honor of President Reagan. At the Woodrow Wilson Plaza entrance stands a 9 foot-high section of the Berlin Wall which was donated in recognition of Reagan's leadership in the tearing down of the wall. Free outdoor concerts are held outside on the Woodrow Wilson Plaza during the summer. Address: 1300 Pennsylvania Ave., NW Washington, D.C. The closest Metro Station is Federal Triangle. See a map. 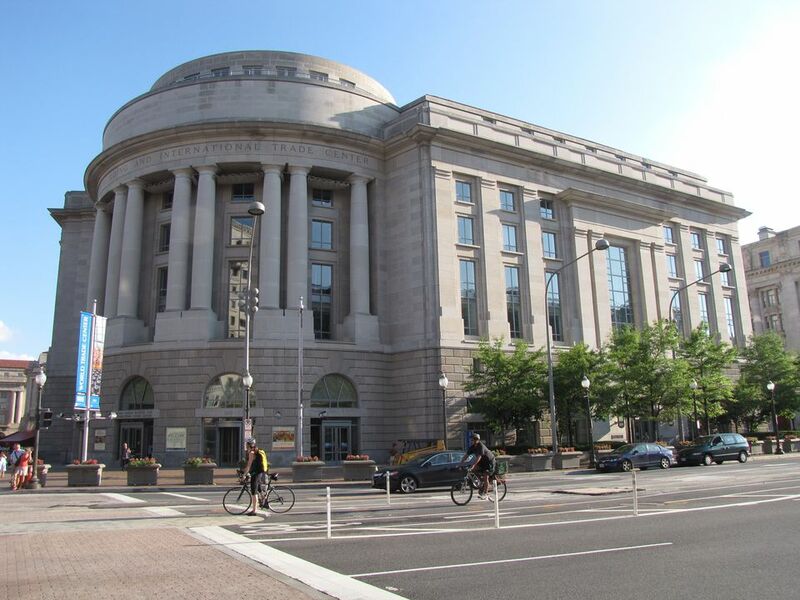 There are six major entrances to the building, located at: 14th Street, 13 1/2 Street, Pennsylvania Avenue, Moynihan Plaza, Woodrow Wilson Plaza and Metro level. Upon entry, all visitors must go through a security entrance. Parking: The Ronald Reagan Building houses a 24 hour/2,000 space parking garage open to the public, with 3 entrances/exits. The cost for parking on a weekend or weekdays after 5:00 p.m. is a flat rate of $13 per vehicle. For visitors who will be staying at nearby hotels, the cost for overnight parking would be $26 per night (Friday after 5 p.m. through Sunday only), or $35.00 per night during the week. With seating to accommodate 1000, the Food Court offers a wide variety of quick dining options including 14th Street Deli, Bassett's Original Turkey, California Tortilla, City Lights of China Express, Everything Yogurt and Salad Café, Flamers Charbroiled Hamburgers and Chicken, Gelatissimo, Great Wraps, Kabuki Sushi and Teriyaki, Kelly's Cajun Grill, Larry's Cookies & Ice Cream, Nook, Quick Pita, R&B Steak and Grill, Saxby’s Coffee, Sbarro, Smoothie King, and Subway. Vendors are subject to change. Hours: Monday-Friday: 7:00 a.m. – 7:00 p.m. Saturday: 11:00 a.m. – 6:00 p.m. and Sunday: 12:00 p.m. – 5:00 p.m. (March - August only) Closed: New Year's Day, Easter Sunday, Thanksgiving Day and Christmas Day. This impressive building with its prestigious address, offers premium conference and exhibit space and a unique setting for weddings and special events. Facilities include two ballrooms, a 625-seat amphitheater equipped with state-of-the-art technology and 15 meeting rooms for smaller gatherings. The Ronald Reagan Building also serves as the headquarters for the International Trade Center, which serves as the official World Trade Center for Washington, DC, an organization that supports and provides guidance to international businesses. Live Lunchtime Concerts in the Heart of Washington D.C.